Styled with gal crew longsleeve and jimmy pant . I'm 5.5" tall 110Lbs. I usually take size 0 for dresses and tailored garments in most brands. Sweaters and jackets I can wear a small. As per reviews I ordered an XS since it said that this item ran slightly larger. I wanted a fitted look to go with high rise wide pants and midi skirts. The jacket feels a bit tight around my shoulders and back (there's no give in the fabric), this might be due to the thick lining... I feel that i could have gotten away with a small but then it would have been a over sized look for me. Happy overall since I can still wear a light top underneath it.Take your regular size and go up one size if prefer a loose fit. Jacket fits well, I got the pink one and it’s nice but not the greatest shade of pink. Maybe a little too warm, definitely wont be able to use in the summer. But it's a beautiful jacket, very nice construction, love that it has an arm pocket and hidden inside pocket. Goring at hips is a little tight, keep that it mind. It should loosen up after a while though. Great quality. I was expecting it to be lighter but actually nicely lined with a jersey type material. I am on the shorter size so went with the size XS (usually a size small) as some reviews suggested it was over sized and the model was wearing a small. Fits almost crop so the extra small hits me at waist and I would have probably liked a small better but still can wear comfortably. Up-sized to a small for layers. Purchased the black in XS last year but find it too tight with hoodie or thick sweater, up sized to S and it is not to big but can now wear with thick layer under. jacket is true to size.. i'm usually a small so the fit is just a bit snug cause i went down a size, though still works... and good quality. would recommend. Not true to size. I ordered the xxs but it was way bigger than that. Great fit, love how it is lined for those little warmer winter days!! Love the construction. Sleeves were too long, but overall quality was amazing. Wish it fit better. I also went with my proper size, xs. I really like the shape of this jacket but the shoulder and chest area are a little tight even after sizing up to a small. It seems that a lot of Aritzia jackets have this problem. I will still keep it because the sale made it worth it. I haven’t owned a bomber jacket before but man do I love this! I’m a short girl so I like the cropped fit a lot, plus the colour is gorgeous! 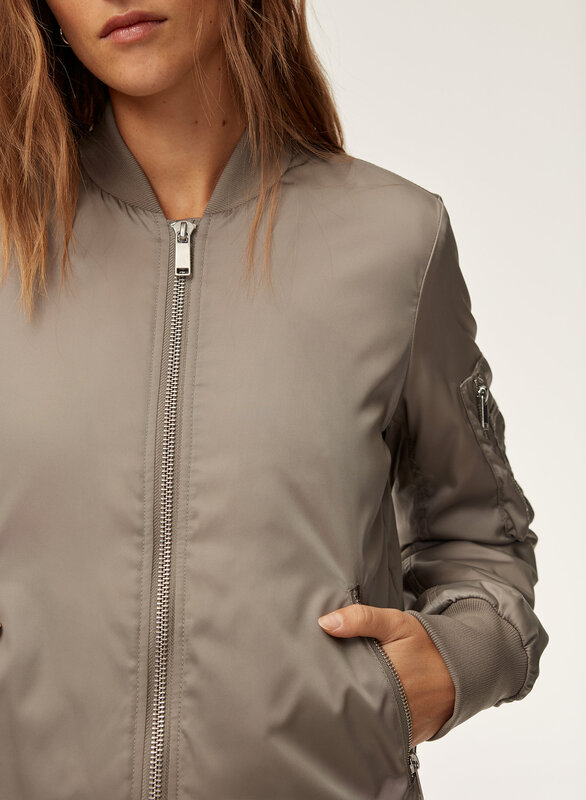 I really love how this jacket looks, but it fits a bit tight around the shoulders/arms when fully zipped up (I'm normally an S in Aritzia clothing, but I also have slightly broader shoulders than average). The texture of the fabric also makes a little bit of noise when you're walking around, but overall I still felt like the jacket was worth keeping for fall. 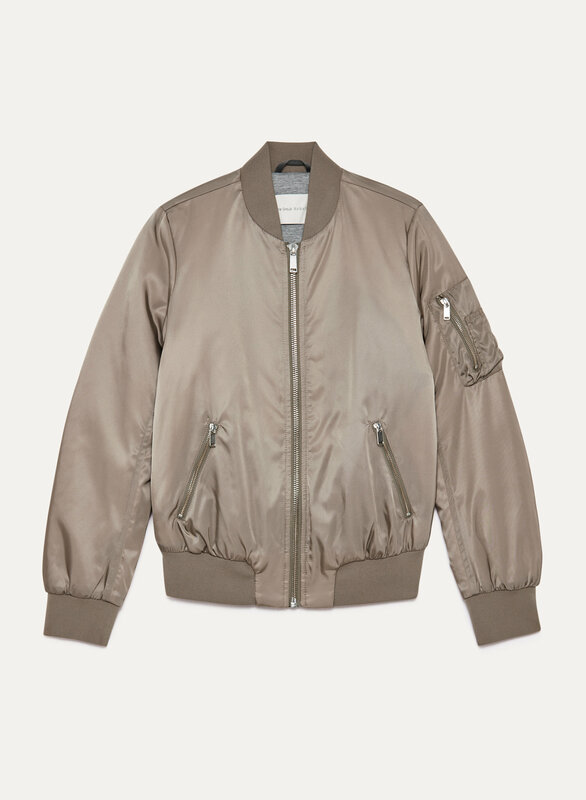 The perfect Bomber jacket. Warm, but not too big.Only down side is that it's a little too short on the back side, but other than that, it's better than any Bomber jacket i was looking at before. size fit quite well. I love the touch of both inside and outside, warm and heavy but not over puff. It is so soft inside and it has a chic look to it.